Having decided upon the front lounge layout, we chose a large Dometic Seitz 900x500 top-hinged, double-glazed window for each side of the van in the lounge area. For the kitchen we chose a 750x400 sliding window - this was the deepest window we could fit so that it would have its top edge in line with the lounge window on the outside (to be asthetically pleasing to the eye), and its lower edge would finish just above the worktop surface. 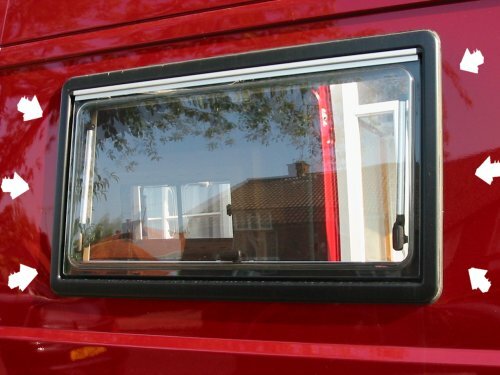 It is a sliding window simply because the van sliding door opens in front of it and a hinged window would be clobbered by the door if left open! Method of fitting windows - Removing internal obstructions. 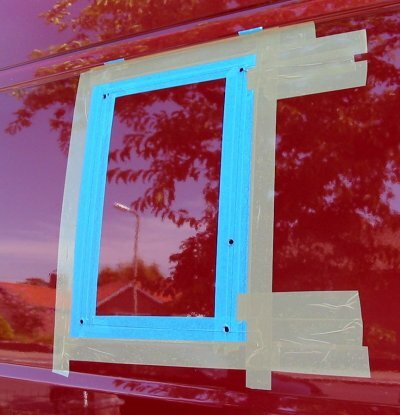 Initially, to locate the position of any window on the outside we drew marks on pieces of masking tape and took measurements from the joins in the van's metal panels. These joins were ideal as datum points as they could be seen from inside and outside and ensured the window would be parallel when fitted. 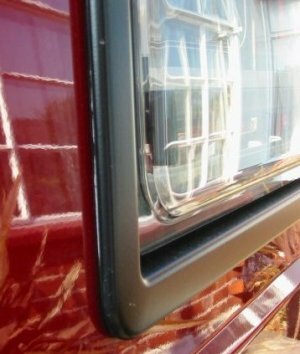 When looking at the van on the outside the eye is drawn to these body joins, so any slope in the fitted window would have looked dreadful! Before we could cut the offside lounge window opening, one of the vertical rib sections on the inside (arrowed) had to be removed. This rib is not structural - it's there to stop the large metal panel from drumming. 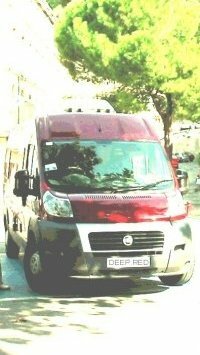 Note on some makes of van the equivalent of these vertical ribs may well be structural members. Best to check with manufacturers if at all in doubt. It seems a bit daunting at first, but in fact there were only two small tabs at the base and two at the top that were actually holding it to the main van structure. 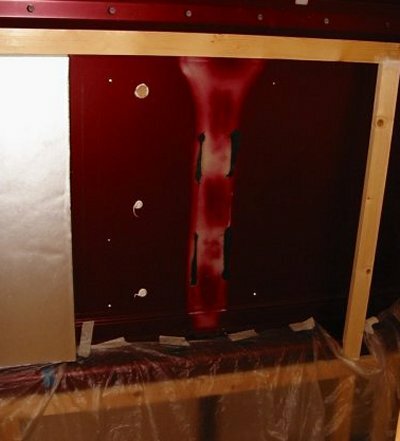 Some soft foam sealant had been applied between the rib and the outer panel to stop vibration. The inside of the toilet window hole being prepared - this also needed a vertical rib removed. We used a Dremel craft tool with a small cutting disc to cut through the rib's tabs. A hacksaw blade in a handle would have done the job equally well. We laid out several large polythene sheets to capture the tiny metal particles. The sliding door had a shallow vertical rib on the inside at its centre point. This rib was part of the inner door skin and not held in place with small tabs at the top and bottom like the other ribs. To remove it we needed a different approach. 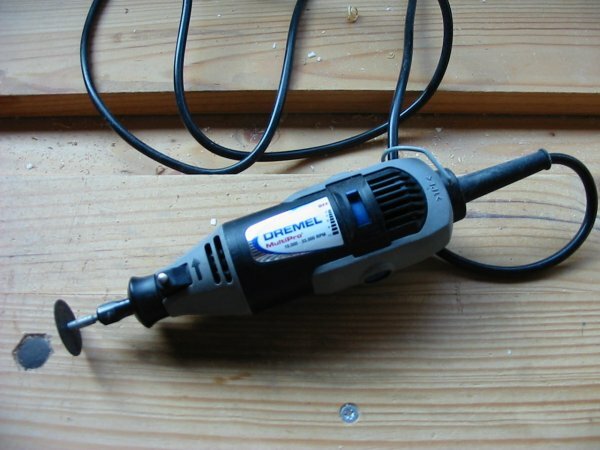 We could have used the Dremel cutter, but in the end we just let the jigsaw cut through it at the same time as cutting the window hole! The jigsaw, with metal cutting blade for 1-4mm thick steel, coped admirably with the two layers of metal. 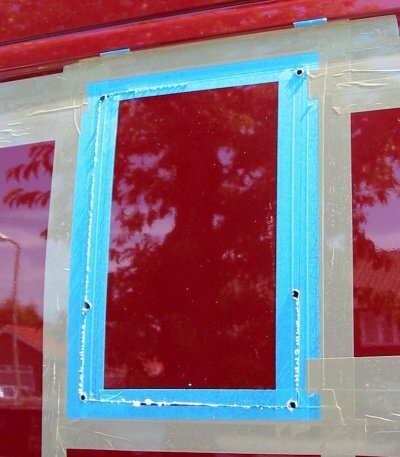 We followed the time-honoured method of covering the area on the outside where the window is to be fitted with plenty of masking tape to protect the paint then measuring and drawing the hole cut-out lines on that. To be absolutely sure we also made a paper pattern with a hole in it the size we wanted and placed that against our drawn lines (the photo shows the toilet window). First we drilled small pilot holes in each corner, then opened them out to 12mm dia., plus one a little way up on each side (call these the mid point holes) as starting points for the jigsaw blade. We found it easier not starting in a corner - the van panel shape made it difficult to get the jigsaw laying flat at these points. Starting from the right side mid-point hole run the saw downwards to the corner. Stop, turn and run along the bottom line to bottom left corner. Stop, remove jigsaw and start again from left mid-point hole, cut downwards to bottom left corner. The waste part of the panel started flapping and vibrating quite alarmingly at this stage. We stopped cutting and stuck wide strips of masking tape over the lines that were cut to dampen the movement of the waste panel. This makes cutting the rest of the panel out much easier. Continue from the left mid-point hole up to top, stop, turn corner and run along top line to its mid-point, then stop. Move to right side mid-point and continue up to top corner. The waste panel was flapping again, more masking tape stuck over cut lines. Carry on along top line to join up with cut line at mid-point. By cutting the hole this way we found the weight of the fairly heavy waste panel was being taken by the uncut portion of metal at the top line mid point. This prevented the saw from getting jammed whilst cutting and made removal of the waste panel much easier as we got to the end of the cutting the hole. And, just like others who have done their own windows, it isn't half so difficult as you may think. 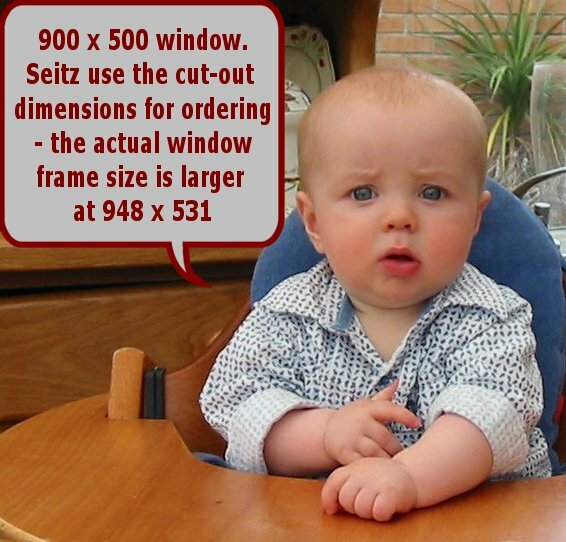 The Seitz windows are intended for flat sandwich caravan-type body panels of 26mm thickness. 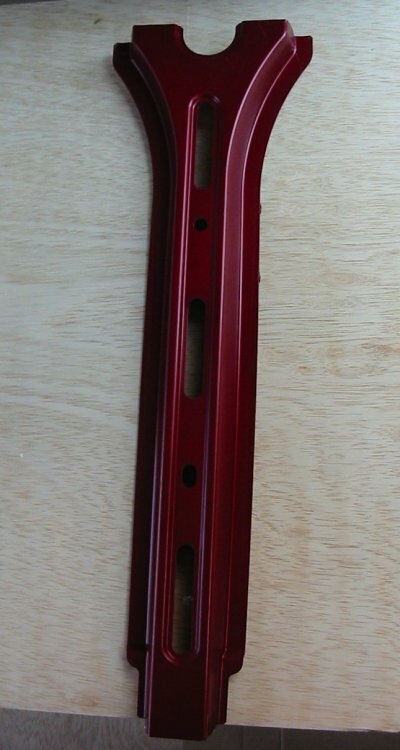 The inner and outer window frames clamp together with screws on the inside. As the van steel walls are only about 1mm thick, battens are needed around the window opening to make up the missing wall thickness. 26mm. - 1mm (metal panel) -3.5mm (ply) - 2mm (glue) = 19.5mm thickness. The 2mm dimension is the thickness of Sikaflex adhesive that should ideally remain after fixing the batten. 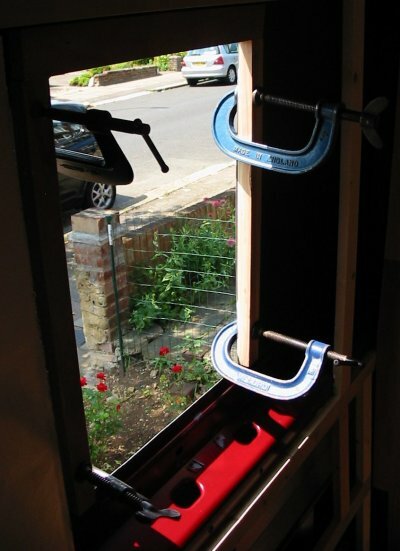 The photo shows the toilet window vertical battens lightly clamped in position whilst the Sikaflex adhesive sets (on a warm day 2 hours should be long enough before removing the clamps). These battens have a slight curvature on their outside face - this explained below. 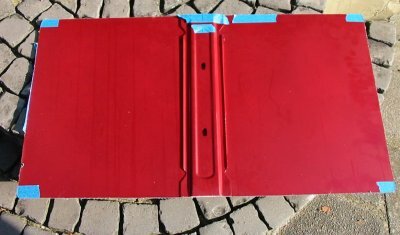 Note, the cut edges of the steel panel have been painted with a grey primer to prevent rust. Whilst the Seitz outer frame has a seal fitted around its inner face, this can only be really effective if fitting the window on a dead flat panel. To improve the seal on our panels - which had a distinct curvature - we used a W4 blue non-setting mastic strip sealant pressed into the 20mm wide channel formed at the back of the Seitz outer frame. The blue mastic can just be seen in the pic. It took several layers of sealant. As we only had the 32mm wide mastic (it comes in several widths) we had to cut it in half longways - a nightmare job - scissors are hopeless as the mastic sticks to everything. We used a Stanley knife freehand on a cutting board. Although the W4 mastic seals the frame from water ingress, we also used black Sikaflex sealant to seal the gaps between frame and van panel. To achieve a neat appearance we applied masking tape all around the window frame and all around the panel - so forming a gap for the bead of sealant (about 6-8mm gap). We waited for a warm day and once the tube of black Sikaflex was opened, worked very quickly to run a bead of sealant round the gap. Then, using the handle end of a teaspoon, run this round the bead of sealant to shape it. The excess of sealant thrown up will be pushed aside onto the masking tape. 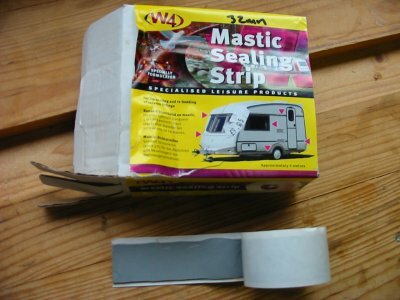 Remove the masking tape asap. It takes a bit of practice! Do wear disposable plastic/latex gloves as black Sikaflex is very difficult to remove from hands. 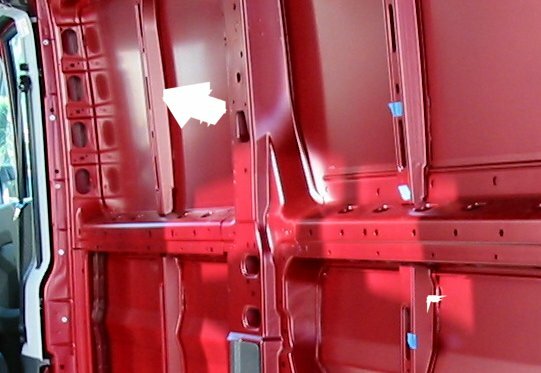 All our van wall panels had a distinct outward curvature. Ideally, the vertical battens around the window opening should also have a matching curvature on their outer face - that is the face clamped to the metal panel. The inner face of the batten is left flat. If this isn't done, and flat battens are fitted, the panel around the opening will be pulled flat and may then distort a greater area of panelling around the window frame. As the Seitz window frames are very rigid, once fitted the outer frame will not bend to take up the curvature of the metal panel. This means gaps will be noticeable all along the top and bottom edges of the frame. 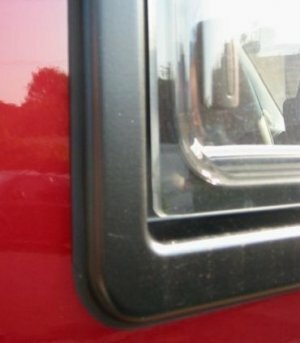 This gap can be filled with Sikaflex sealant as shown above. This is a perfectly satisfactory solution. After fitting our first window - the off-side lounge window - a semi-circular area of metal panel which surrounds the outer frame on either side was slightly flattened (the arrows show the extent of this in the pic although the 'shadow' in the pic tends to exaggerate how much this actually was!). We managed to correct this later by easing off the window frame fixing screws and filling the frame/panel gap that subsequently appeared using Sikaflex as mentioned above. If the window frame almost fills the whole panel area (as it does on the sliding door) then no distortion is visible even when using flat battens. A similar method was used for cutting the holes in the roof as we used for the windows (apart from being up a ladder and reaching over at full arm extension). 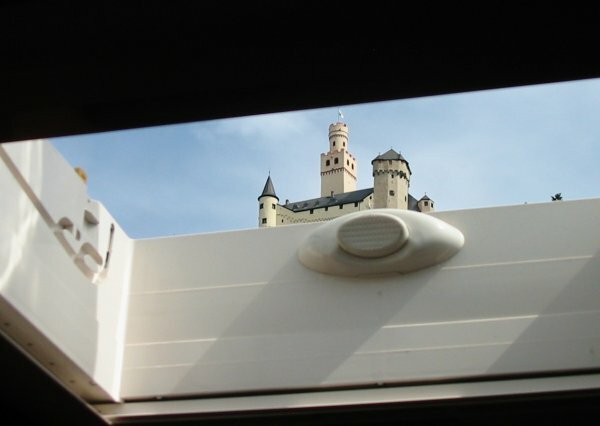 The Midi-Heki large front rooflight, and much smaller Mini-Heki rooflight at the rear, have different methods of fixing from the windows. 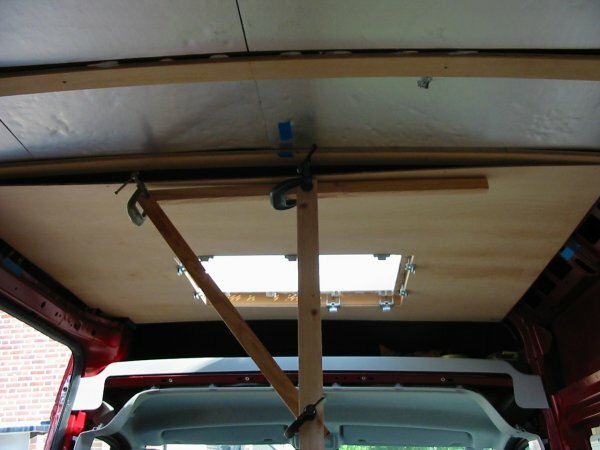 We still had to fit battens around the hole on the inside, but the shape of the roof and design differences meant the thickness was not the same for both rooflights. As with the windows, once the holes were cut, metal primer was brushed on all bare metal edges. For the front rooflight, Mr Fiat has kindly arranged for the roof metal pressing to have a nice flat area in the front centre. Unfortunately, we could not find a rooflight frame which completely matched its dimensions. This meant the Midi-Heki frame overlapped the onto the corrugated roof panel along its back edge. We had to use some thin hardwood strips completely embedded in Sikaflex to fill the cavities in the corrugations. This was tricky as the strips were all different thicknesses as the roof curves acrossways. Not a nice job, but it hasn't leaked at all. The Heki outer frame was laid on a bed of W4 blue mastic strip applied to the van metalwork around the opening. The inner fixing clamps were then fitted the screws tightened to pull the outer frame firmly into position. In places, some of the excess blue mastic oozed out the side of the join between the frame and van metalwork; this is easily wiped up. A bead of white Sikaflex was then applied between the outer edge of the Heki frame and van metalwork. W4 blue mastic does not set hard, if for any reason in the future one had to remove the Heki outer frame, it would be a much easier job than if Sikaflex alone had been used; (Sikaflex does not set rock-hard, but is tricky to remove, invariably a sharp knife blade will be required). The metal clamps supplied with the Midi-Heki rooflight are only suitable for roof (total ceiling) thickness 30-34mm. Ours, with ceiling battens and ply lining, came out at 57mm. so we had to order a set of suitable clamps (for supplier see Sources). This thickness is right on the limit for these clamps, which are the longest available. 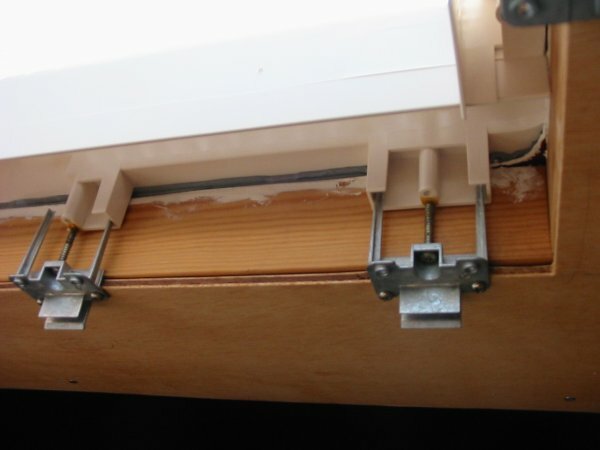 To secure the outer frame, the Midi-Heki uses metal clamps which are screwed into the wood battens on the inside. 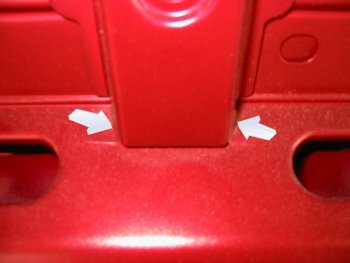 A single screw passes through each clamp and into a moulded hole on the outer frame. We found these screws had a very poor rolled thread and were very tight in the plastic frame holes; we were afraid of mangling the cross-head pattern screw heads, so we changed the screws for better quality ones which did not bind. A dab of petroleum jelly on the threads is helpful. 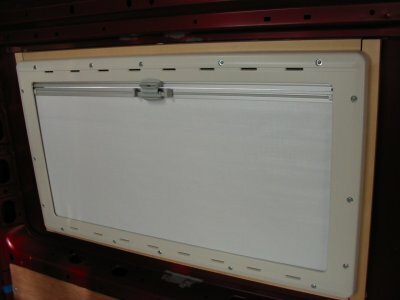 The inner cover, which incorporates a concertina-type sliding sun blind and fly screen, fixes to the metal clamps using quite small spring steel clips which bite into projections on the metal clamps. Having had this inner cover fall down on several occasions, we surmised these spring clips are not up to the job. We are looking for some stronger ones to replace them. What with the rattles that emanate occasionally from the folded-up sun blind and fly net as one is driving along, we're not overly impressed with this product given its cost! Despite this irritation, having a large rooflight above the lounge is well worth it - it helps with ventilation on very hot days and floods the interior with light. 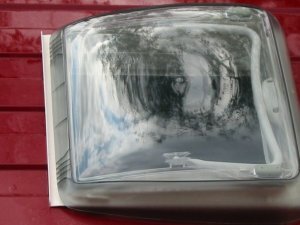 The rear Mini-Heki rooflight also needed small infill pieces between the roof corrugations on the outside along the front and rear edges. 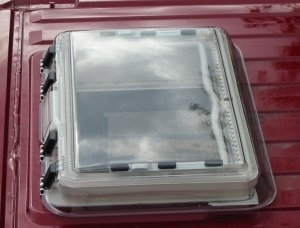 This rooflight has an inner frame and captive screws which fit into moulded holes in the outer frame. Fortunately, the design is such that only longer screws would be required to clamp the whole thing together if used on a deeper ceiling. We chose the Mini-Heki version with built-in ventilation. Whether this is enough for the internal area of the van, and meets the standards laid down for ventilation, we have yet to determine. 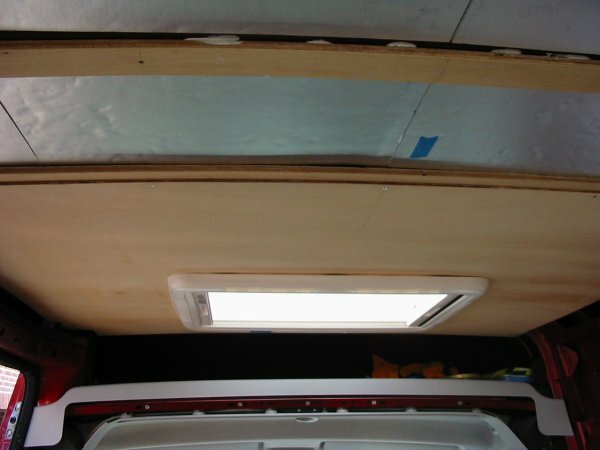 The inside of the rear Mini-Heki rooflight without the inner frame fitted. 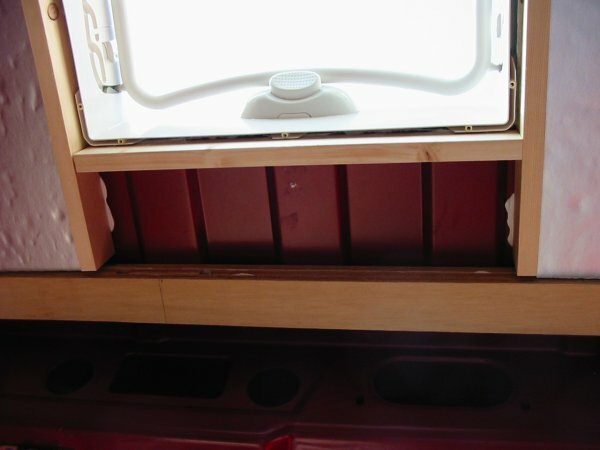 The battens around the rooflight opening are the same depth as the surrounding roof battens to match the ply lining when it goes on. • Update. Mini-Heki rooflight with the inner frame fitted and integral blind drawn. This is a well-made product and still obtainable at a reasonable price and altogether better (in that the integral blind and flynet don't appear to rattle when moving) - unlike the larger Midi version. 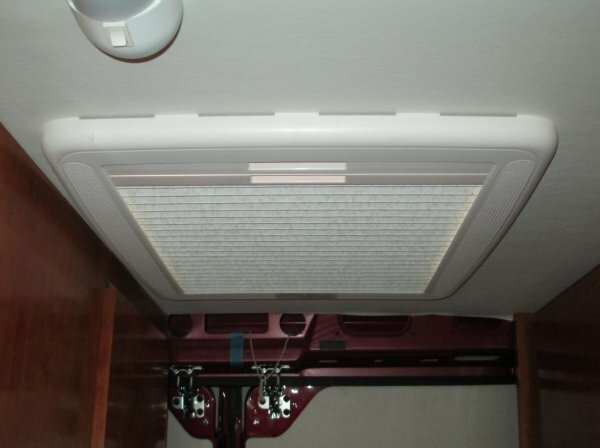 Note, this version has in-built ventilation; an alternative version is available that doesn't have this feature. We have not noticed any cold air draughts from the rooflight as it is always open at least one notch when we've parked up. You never know what you may find when opening a rooflight!